www.cullingtindrivingconcepts.com after 30 years of behind the wheel training. 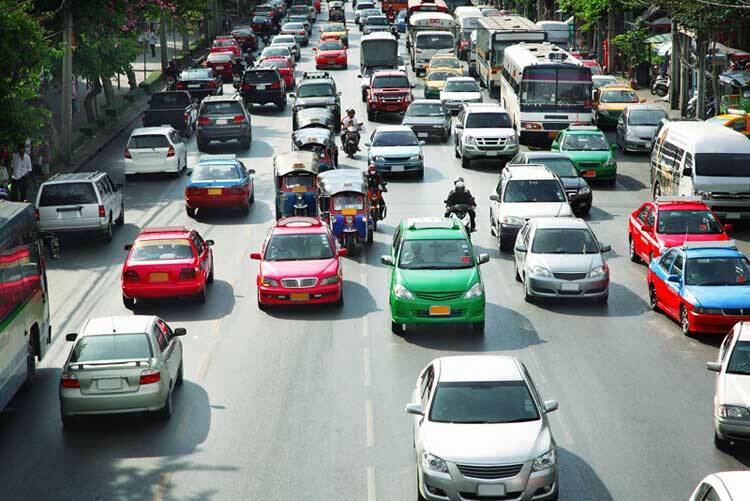 All aspects of driving are covered and show the new driver and their driving coach what to expect and do before going out into modern day traffic. 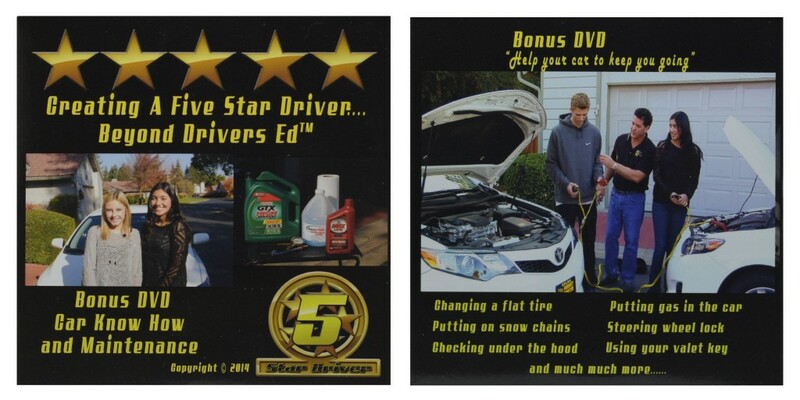 DVD package includes 5 DVD set totaling 10 hours of quality instruction. 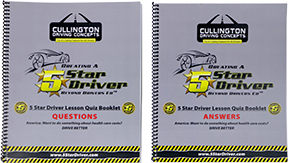 Also included are: 5 Star Driver Question and Answers Manuals and Our Car Know How and Maintenance DVD as listed below. The 37 lesson quiz question and answers manuals. A real teaching opportunity of its own as the answers are given with complete explanation as to why the answer chosen is correct or wrong. Full color graphics. Covers basic car maintenance under the hood, includes changing a flat tire, putting on tire chains, also what the interior and exterior knobs and switches of an automobile do. Most young people today are in the dark to what it takes to operate and maintain their car. This well produced DVD covers a lot in an hours’ time. Control the driver and you control their driving. In this 160 page book people who teach a loved one to drive will learn actual driver training methods used in multiple driving situations. 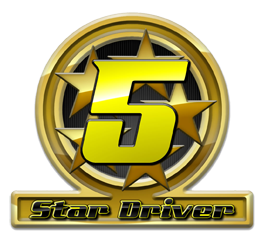 The first day of driving, all types of turns, lane changes, freeway situations, parking, heavy traffic, and more will be made clear. Take advantage of 27 years of teaching driving from Master Driving Instructor John Cullington, the originator of the highly successful Cullington Driving Concepts. Licensed Driving Instructors are required by law to have an instructors mirror for their safety, and so should you. 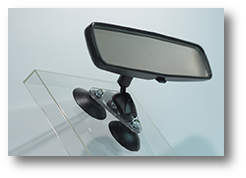 The PDI Mirror attaches in seconds to any windshield utilizing three industrial grade suction cups and is easily transferred from vehicle to vehicle. Having a mirror on their side of the car will result in parents driving much more with their new drivers. The mirror will help immensely with lane changes, slowing down in traffic, merging onto freeways and backing out of parking places. 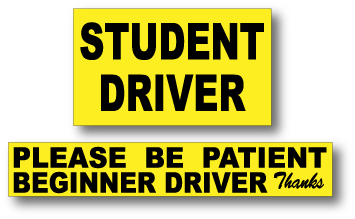 you and your new driver make the most out oHelp f practice time by letting drivers around you know that a Student Driver is at the wheel. People are naturally impatient in traffic but also just as understanding when they see that it is a rookie at the wheel. What’s more, our Student Driver signs can reduce the risk of having an accident before they even have their license. Click here to see the various magnet designs for all types of cars. 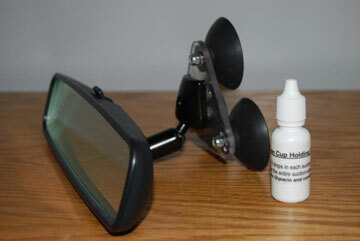 The Parent Driving Instructor Mirror can easily have new suction cups with these three industrial grade cups. "We have taught three kids to drive. One without your mirror and helpful DVDs. Most recently taught our twins with your help. So much easier! Thanks Elite". "The book and mag. signs are worth their weight in gold. I haven't yelled at my son in months since cars quit honking at us. I'm pleased with his driving". "Thanks for all your help. All the information was right on and the extra tools had me driving more with my daughter. Your customer service is top notch".